When was the last time a song you never heard before totally pierced your brain to become an automatic favorite? Research says there is a “magic age” somewhere in our 20s where our musical taste becomes more set, owing to a combination of factors ranging to hearing loss to not having as many new experiences for music to soundtrack. While some people concern themselves with anti-aging creme and memory-extending games, I am more worried about avoiding the potential to stop liking new music. It’s terrifying to me. Even though I already have lists of thousands of favorite songs, I still want more. Really, it’s not as though we stop appreciating songs entirely at some point. It’s about our preferences becoming locked in. If you’ve always loved Garth Brooks, chances are you might still enjoy a new Garth Brooks song when you are 42. The thing that could become more scarce is liking something that sounds entirely new. From that perspective, I don’t think me liking “This Town Ain’t Big Enough For Both of Us” is as encouraging as me falling in love with the songs of Czarface on that same night, as East Coast Hip Hop is a little bit further outside of my typical preferences as the Glam Rock of Sparks. Glam Rock was my whole life for a while there, right? The theme song of my new internet show is a song called “Glam,” wherein I state “When I was 16 I thought I was David Bowie because nobody told me there was more than life than being glam.” Liking Sparks should come as no surprise. 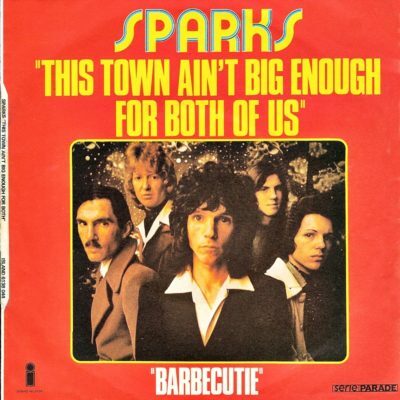 One way it was a surprise was just that I had never heard of Sparks. I have a pretty encyclopedic knowledge of rock history and a song collection to match, yet they were a complete stumper for me when Liz put them on the stereo. Not only that, but the song sounded completely alien to me. I instantly recognized it as a form of Glam Rock, but it also had a galloping free time feel to it that I associate with mathier rock, like Rush. And I was convinced it was being sung by a woman, which left me completely incredulous when Liz reveal the band is comprised of a pair of brothers!